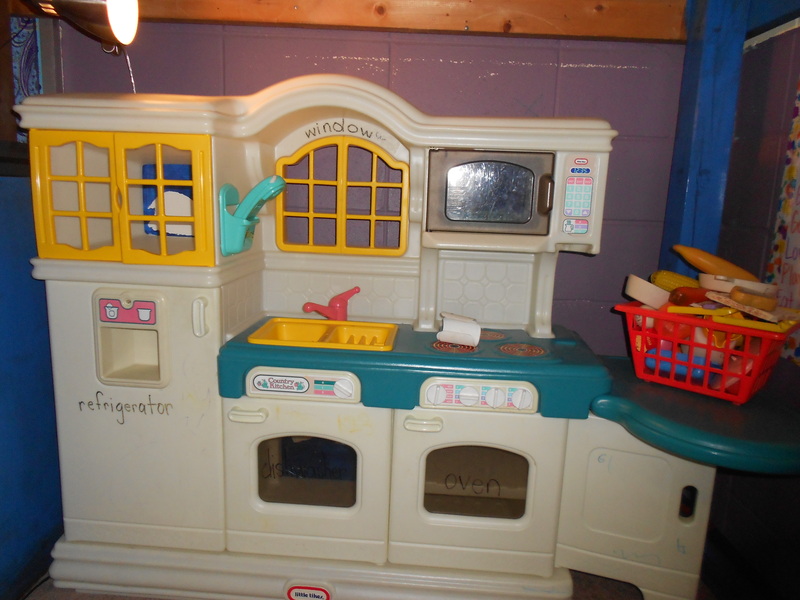 Teaching Kindergarten…Keep The Home Living Station! When I was a five year old kindergarten student, K-5 was actually all about learning to come to school. We learned social skills like how to share, how to help others, how to be a friend. We learned the importance of keeping up with our belongings, taking care of school property, and working with our emotions. We learned how to get along. We learned how to be a student. Now kindergarten is still a very important avenue for learning social skills, but we are also learning to read (pretty fluently), write stories–both realistic and fiction– and to add and subtract by the end of the year. I don’t know about other kindergarten teachers, but I have found myself in a place before where I have forsaken the importance of teaching social skills in order to teach more reading, write more words, and add more numbers. I’ve spent more time blending and segmenting phonemes than I have teaching my kids what to do if they have to share a toy. And I wonder why they bicker. I wonder why they tattle. I wonder why they have one crayon left in their pouch after just a week of school (Teacher, I don’t have a red…or a blue…or an orange…). I know I’m not the only one wondering. In talking with teachers in many districts, I’ve discovered that there is some concern with the social skills of our older students in schools today. Bullying is becoming a presence that needs to be dealt with. Not only the bully-er, but the bully-ee (Did I just make up some words?). Older students don’t know how to treat each other anymore. They haven’t had lots of practice with sharing, speaking, listening, and working with one another in a non-academic setting. Some students are “being mean” to get attention, relationships (what they think is a relationship), and acceptance. Other students don’t know how to react to someone treating them in an unwanted way, and they are dealing with anxiety that comes from not knowing how to deal with different people. I think one way to help this situation is to give students more time to have social interaction when they are young. Before they become self-conscious and create different stations and groups among themselves. I was on a vertical Language Arts team for my school for two years and we worked very hard to align our curriculum with the new College and Career Ready Standards for English Language Arts. One of the main topics we discussed and worked on was vocabulary. We looked at the research about the importance of teaching our children Tier 2 and Tier 3 vocabulary words. Tier 2 words are high-frequency vocabulary words that may or may not have multiple meanings, like savor or ability. Tier 3 words are lower-frequency words that are specific to a certain context (the words you used to write down and define in biology class). As the discussion went on, I agreed that instruction on these words was so important. It’s needed. But I had a growing sense of urgency about another type of words that I realized many kindergarteners were lacking, Tier 1 words. I, along with other teachers in my school and other schools, was focusing on teaching these wonderful Tier 2 and 3 words when I had kids that didn’t know what friend, baby, and sorry meant. I had kids that didn’t understand the meaning of beside, below, above, and in front of. So I really started thinking about my teaching of social skills and what I call “social words”(this is just a Paige Givens term, not fancy or official by any means). How could I teach my kids these words and skills in a natural, authentic way? The answer was right in front of me, in a sunny corner of my room, begging not to be thrown out, as so many kindergarten teachers are being pressured to do. It was my kitchen! But I am here to advocate for the Home Living Station! There is a place for it in your curriculum! Your kids need time to play and talk with each other. They need space to make believe and work together to make their imaginations come to life. They need opportunities to practice sharing and “working it out” when there are not enough supplies to go around. They need opportunities to disagree. A few years ago, I brought my Home Living Station up to speed with vigor and excitement. I decided to use it as a teaching tool during my Literacy Work Stations (YES, during Literacy Stations! ), and started off the year with a few kitchen utensils, plastic foods, and baby dolls. I have found that if I use fewer props at the beginning, it’s easier to teach how to clean up and it leaves room for more language exchanges. I also use lots of modeling at the beginning of the year for having nice hands, words, and feet at the Home Living Station. I have found that the Home Living Station is one of the greatest opportunities for the speech pathologist to work with students who are acquiring language skills. It’s a natural, authentic environment for students who need extra support in developing oral language skills. I divide up my Home Living Themes by the month most years. Here are my plans for Home Living each month of the school year. My wonderful kindergarten teacher partners at my school collaborate constantly to improve our stations. They’ve graciously included pictures of their Home Living Stations. “My Home”- we are just learning to come to school, so this month is all about learning how to use the materials at home living. We do lots of modeling and practicing. The Home Living Station is usually everyone’s favorite station to choose (both boys and girls). “Grocery Store”– I have parents send in empty cereal boxes, snack food boxes, cleaned out milk cartons, etc. We label each item clearly and students work at the grocery store to make a grocery list by copying the labels onto their list paper. They use pretend buggies and cash registers to act out buying their grocery list. 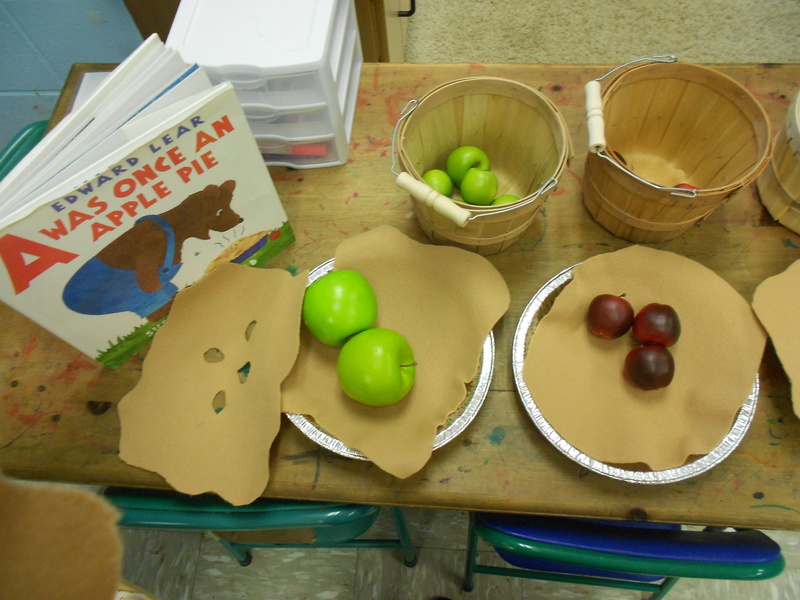 “Apple Orchard”- My teacher friends Lori and Connie created an apple orchard in their classrooms this year with some plastic apples, pie tins, felt, and baskets. The kids LOVED it! “Pumpkin Patch”- going along with the apple orchard theme, teachers can gather plastic (or real) pumpkins, fall leaves, scarecrows, etc. and set up a pumpkin patch. Students can sort pumpkins by size and color. 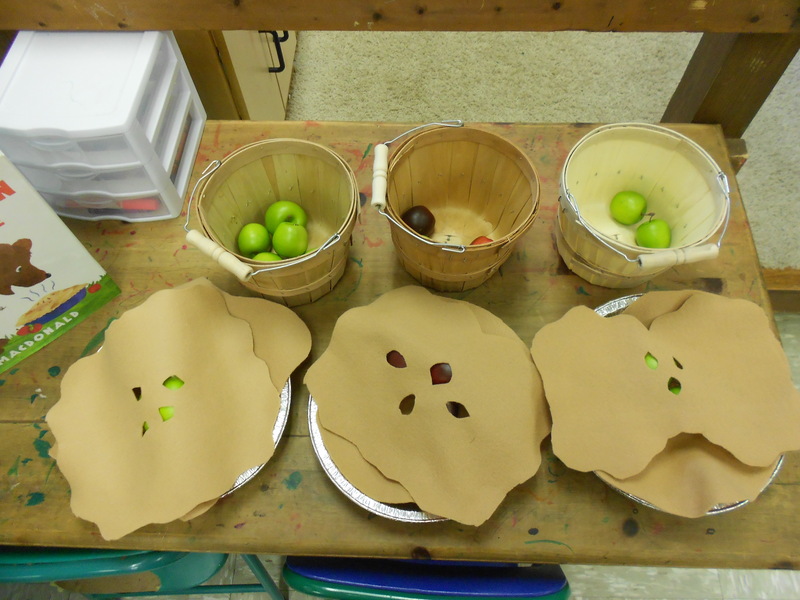 They can also make signs, lists, and all sorts of written materials for their pumpkin patch. “Restaurant”-I can usually get local restaurants to donate check receipt notepads for the students to write orders on. I put names of menu items on a ring and students use these as guides for writing. Some restaurants also donate aprons. “Christmas”- for the first week or so, I literally just set up a small Christmas tree and have the kids bring in safe ornaments for our ornament basket. They spend the entire time over at Home Living putting ornaments on the tree and taking them off. They love, love, love to decorate the tree. We also make lists of people to get gifts for and we make wish lists for ourselves. “Woodshop”- I put pretend tools and wooden blocks out and students make lists of tools that they will need for their woodshop. I put labels of tools on a ring for students to use as a guide. Students also make lists of things to build in their woodshop. “Pet Store”-our wonderful lunchroom staff lets me use the empty milk crates for my pet store. I connect the crates and put them up on their sides, then put stuffed dogs, cats, turtles, etc. in the cages, along with water and food bowls. Students list pets for their shop and create lists of needs for their pets. “Post Office”- We take a large cardboard box and cover it with blue paper in order to turn it into the blue Post Office mailbox. I supply the station with pretty paper, hearts, stickers, “stamps”, all sorts of fun writing utensils, etc. Students make cards for each other all month and put them into the mailbox. It’s a very exciting day when the mailbox gets opened and cards are distributed. 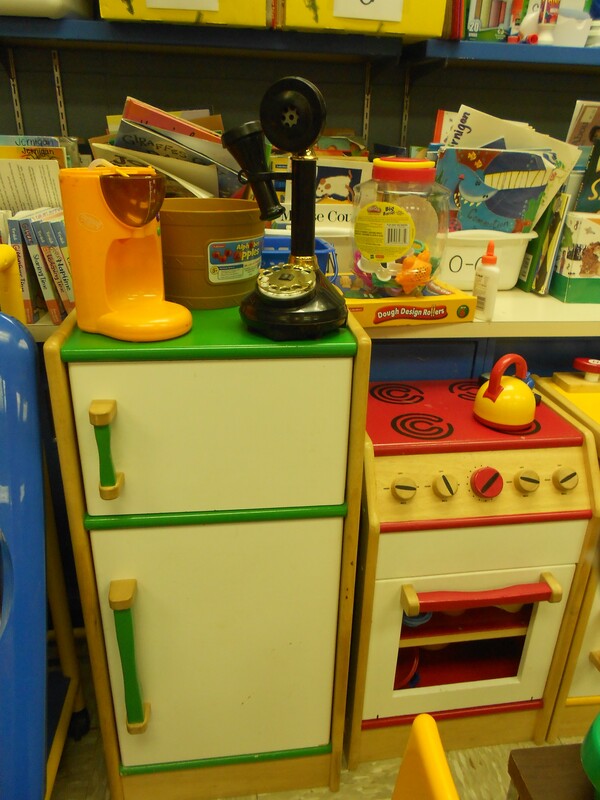 “Toy Store”- Students bring in small toys to “sell” in our toy store. They make price tags and wish lists. “Bakery”-bring on the chef hats! Students make lists of ingredients and sweet treats to bake in their shop. “Pizza Parlor”- while we’ve got the chef hats out, we make pizzas. I get a local pizza shop to donate empty cardboard pizza boxes and students list ingredients and toppings for their pizzas before they “cook” them. “My Home”- the difference from August to May is amazing. I love to set the house materials back up and observe the differences in my children. Their growth and maturity always inspire me. These are just a few ideas from my school. The possibilities are endless! If you are a preschool or kindergarten teacher, please keep your Home Living Station alive and well. The benefits far outweigh the noise, the mess, and the time it takes to set up the station! Please share this with your K and preschool teacher friends and share your ideas for Home Living in the comments below. We’d love to hear from you! *Note: Since this was posted a few school years ago, I’ve moved Home Living Station to a Morning Activity and a Math Station, because students have a longer amount of time to work and play during these periods. This entry was posted in Teaching and tagged Kindergarten teacher, social skills. Bookmark the permalink. 11 Responses to Teaching Kindergarten…Keep The Home Living Station! This makes me want to go to kindergarten! You’d love it! You’d be a great teacher! This is awesome Paige! I wish Luke would have had you in kindergarten! Thanks Ashley! He’s so big now! I can’t believe how grownup he is! 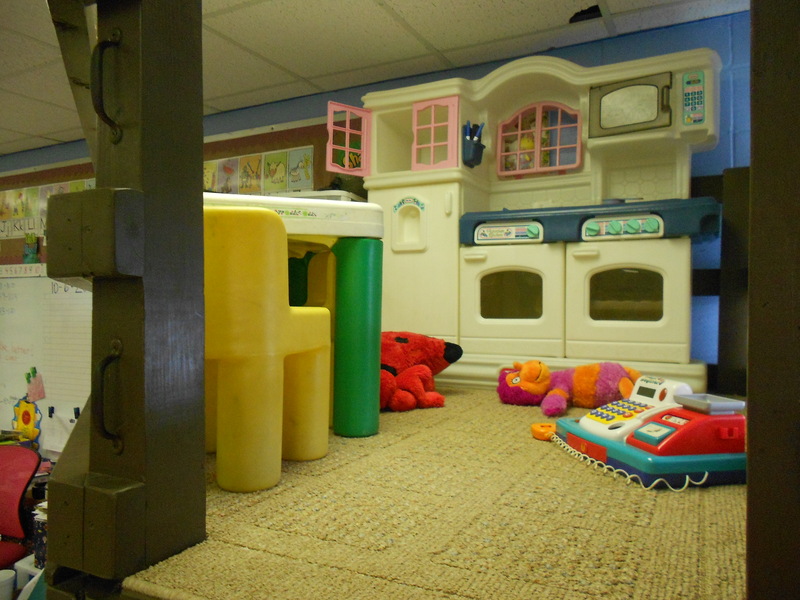 The Home Living Center is the BEST place for young children to be their authentic selves! I love putting children’s cookbooks in there, scrap paper for students to write their shopping lists (ex: cabj) using their invented spelling, paper for creation of menus, clipboards for taking orders, telephone pad for taking down messages when someone calls, gift wrapping and writing names on tags during the holidays, notes for the doctor/vet to take when seeing patients, envelopes, stationary paper, etc., to set up the home office. All of these things rotate throughout the year like you discussed. The children find meaning in their work and are motivated to focus and learn to work together. It is an amazing center and should go through first grade! I totally agree! Do you have several other K teachers at your school? How you doing? I really like the way you write this “Teaching Kindergarten…Keep The Home Living Station!”. Thanks for the informative post, I learned a lot from your article. Boost Up!